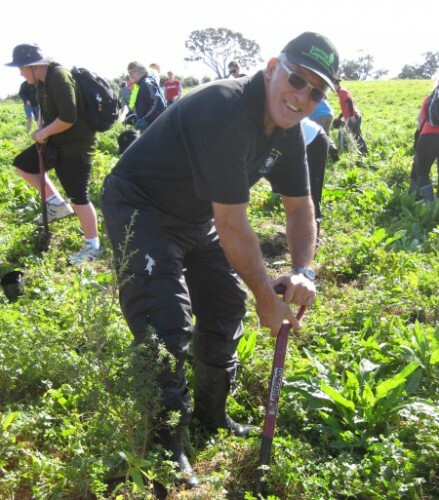 With the help of volunteers and Rugby Legend Bryan Williams, Living Legends planted 8,650 native trees at Motuihe Island. Motuihe Island lies between Motutapu and Waiheke islands in the Hauraki Gulf, near Auckland. The island measures about 179 ha, of which around 18 ha are remnants of coastal forest. The island is a Department of Conservation controlled Recreation Reserve, and is a popular spot for day trips, either by 30-minute ferry trip from Auckland or by private boat. The island is famed for its beautiful beaches. The name comes from Te Motu-a-Ihenga, meaning ‘Ihenga’s Island’ in Māori. 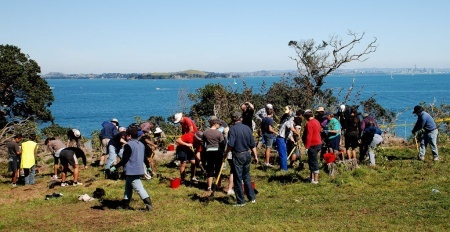 The formation of the Motuihe Trust in 2000 was the first step in a major restoration initiative which continues today. The Trust operates its own nursery on the island providing eco-sourced plants for revegetation, and through its volunteers has carried out extensive planting on the southern part of the island. Significant conservation work has been carried out on Motuihe and in 2009, fifteen Little Spotted Kiwi were released on the island. As an island, now free of predators and most weeds, Motuihe is an outstanding ecological asset both regionally and nationally. Living Legends will continue to oversee the maintenance of this planting project in conjunction with the Motuihe Trust, who will care for it for years to come. It would be hard to think of anyone who made a more monumental contribution to New Zealand and world rugby than Bryan Williams, whose involvement and service to the game has been virtually life-long and has covered all aspects. As a player Bryan rates as one of the greatest wings produced by New Zealand. And when he retired after a long career he devoted himself to coaching, achieving remarkable results firstly with Auckland and then with Manu Samoa. Originally a schoolboy league player, Bryan first showed his extraordinary talents as a rugby player while attending Auckland’s Mt Albert Grammar School. In his first class debut in 1968 he scored four tries and kicked two conversions. Still only 18, Bryan made the Auckland A side in 1969 and that season playing mainly at centre, began to show the pace, power and prodigious sidestep which in 1970 catapulted him into the All Blacks for the 1970 tour of South Africa. In South Africa Bryan was a sensation, scoring 14 tries in his 13 appearances and in the international series he scored in each of the first and fourth test. Bryan was always a much respected international and opposing sides feared his strength of running and his physique of 1.78m and weighing in at more than 82kg. Bryan toured with the All Blacks to Australia, Fiji, Ireland, Wales, England, and France. In all, Bryan played for the All Blacks 113 times and in his 38 tests scored nine tries. In his complete rugby career of 269 first class games Bryan scored 825 points, of which 137 were tries. After professional rugby, Bryan devoted himself to coaching. He has been involved in coaching with Ponsonby, Auckland. In 2000-01 Bryan was the assistant coach with the Hurricanes in the Super 12, and in recent years he has coached Auckland development sides and been heavily involved with the administration of the Ponsonby club, of which he is a life member. and we'll be in touch with all the details. Thanks. You've been registered for the event. We'll be in touch. © Copyright Living Legends, 2019. All rights reserved. Sign up with us and we'll keep you updated with news and offers from Living Legends, and be in touch about how you can get involved. Thanks. You've been added to our list. We'll be in touch.